Fogo de Chao has added some spring menu items and we had the opportunity to taste them. Overall you’ll see all the same things you love at your next trip to Fogo, but you might also find some new things you didn’t know you needed. Carrot and Ginger Soup: this soup is thick and creamy, made with baby carrots and spicy ginger, blended together with fresh herbs and coconut milk. It’s vegetarian, but not vegan, and you’ll taste all that creamy goodness when you eat it. We were huge fans of this soup. Roasted Cauliflower Salad: this salad is made with oven-roasted cauliflower, but it is served cold on the market table. 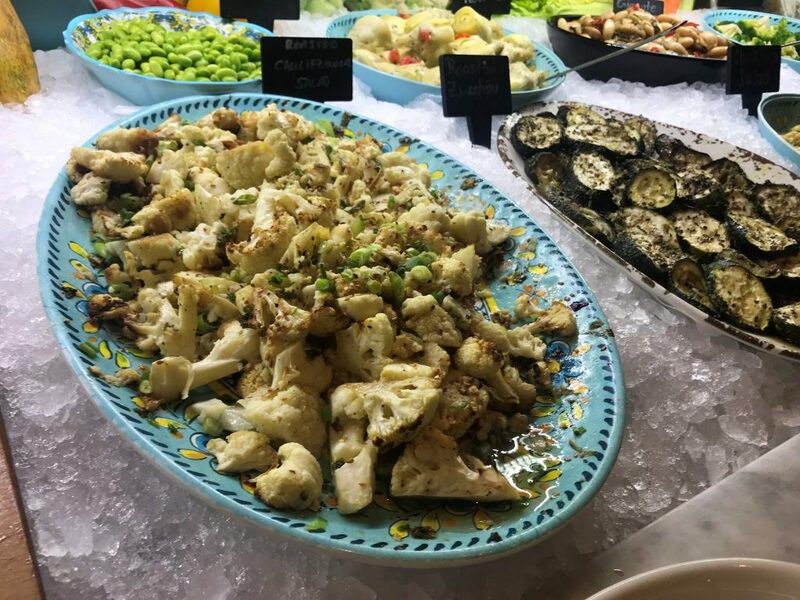 Enjoy cauliflower that has been oven-roasted with olive oil, garlic and black pepper, and finished off with scallions and sesame seeds. The flavor of the roasted cauliflower comes through beautifully on this salad. 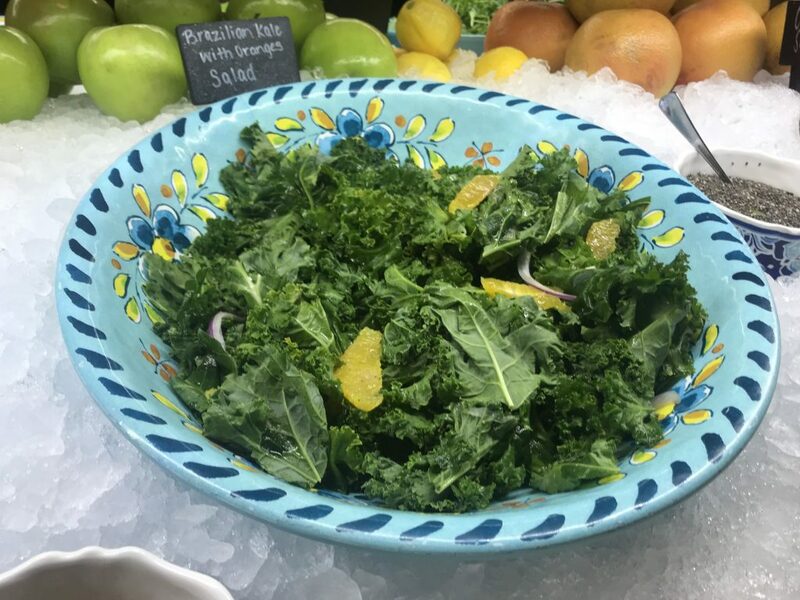 Brazilian Kale & Orange Salad: this salad of fresh kale, crunchy red onion and juicy oranges, topped with a citrus-honey vinaigrette is worth a taste, even if you aren’t a kale lover. The woody stems are removed from the kale, so it’s not more chewing than a typical green salad. The onions, oranges, and honey-citrus vinaigrette are beautiful together. Find this salad on the market table as well. 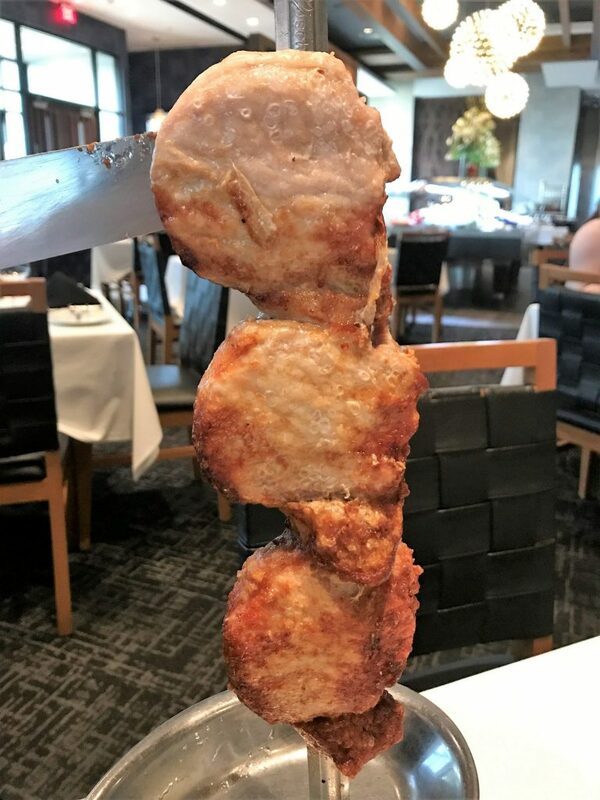 Pork Picanha: this is butchered and prepared with the same simple style as the traditional Picanha you love, and brought to your table to be carved like every other meat at Fogo. We found the Pork Picanha to be on the salty side, but it was interesting to see a new cut of meat prepared in the half moon style. It’s definitely worth trying. 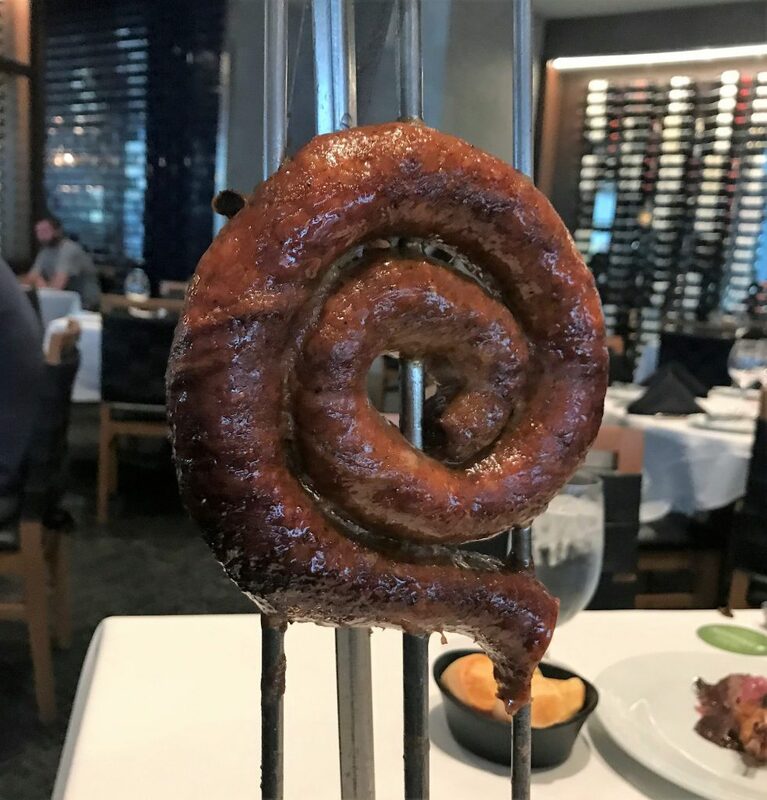 Linguica Sausage: if you love sausage you will fall in love with this new meat option at Fogo. This is a pork sausage with red pepper, garlic and fresh onion. Instead of small, individual sausages like the regular sausage that is served, this is a long sausage that it coiled and then placed like a lollipop on the sword for fire roasting. A piece (or two) is sliced off onto your plate. As a sausage enthusiast, I enjoyed this iteration even more than the regular sausage served at Fogo. Creme de Coconut: this rich dessert served a la mode will be somehow familiar yet entirely new. Freshly-shredded coconut is combined with condensed milk and cream, baked in the oven, then served warm with ice cream and a little lime zest. The oven-hot dish of coconut goodness is reminiscent of gooey bread pudding or possibly creme brulee, but has its own texture. It is rich and sweet, and you will smell the lime zest when they set the plate down on your table. 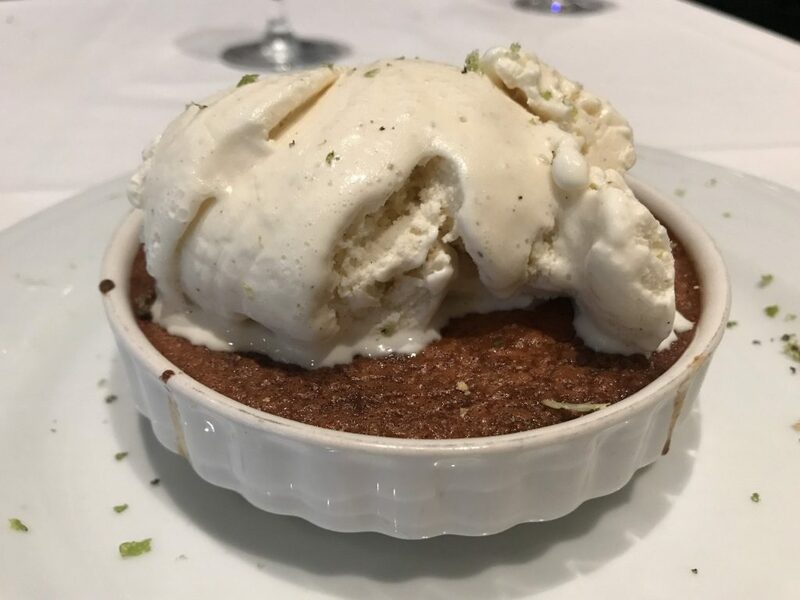 It’s hard to save room for any desserts when you are scarfing meat served rodizio style, but this is a great dessert to share. It’s very rich, but also impossible to stop eating. Eulila: this new red wine blend pays tribute to Eulila “Selma” Oliveira, Chief Culture Officer of Fogo de Chão. Oliveira has been with the company for over twenty years. 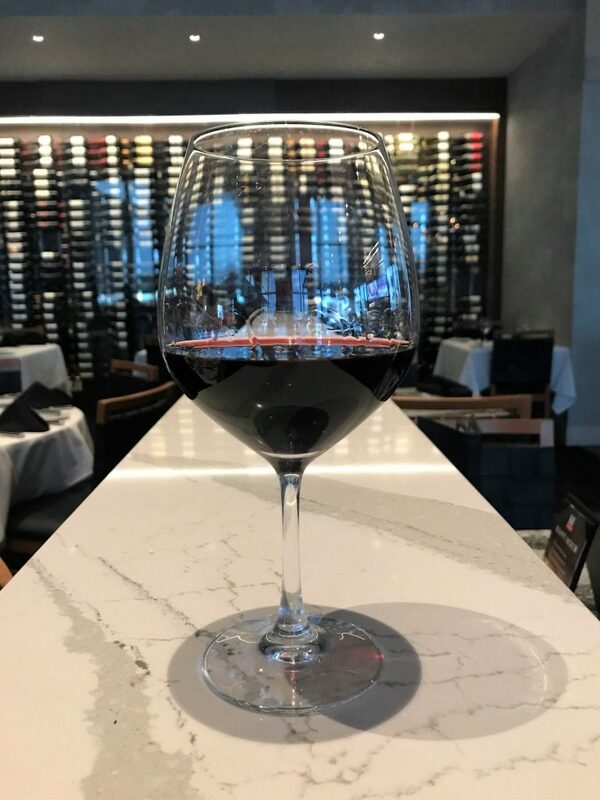 This blend is Carmenere, Cabernet Sauvignon and Syrah, and was specially created exclusively for Fogo by the award-winning winemakers at Viña Vik. If you want to know which one wine you should try to go with your meat, this is the one. Now you’re ready to go eat all the meat! And the salads, and soups, and desserts, and drinks. Note: From time to time we’re invited out to try a restaurant or to taste new menu items. This meal is usually comped, as this one was. We’re under no obligation to write a positive review or any review at all when we’re invited out to try a place. Every review you see on our site will be an honest review of the place whether or not the restaurant provided us with the meal at their cost. Tagged Brazilian, Dessert, Dinner, fine dining, lunch, meat sweats, special occasion, Wine. Bookmark the permalink. If this review helps you decide to visit this restaurant. Please tell them Jax Restaurant Reviews sent you! !